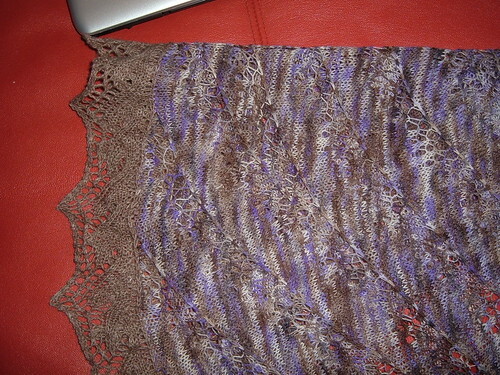 Yes, the Shawl of Doom is done. 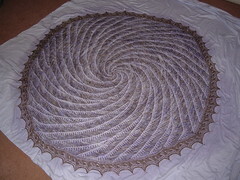 Finished, blocked and photographed. Pretty! And soft. When I wear it (cruise, anyone?) I’ll get pictures of it on me. Sadly, because the weather was bad again, and because I had a hospital appointment (cancelled – again) I didn’t make it to Knitting at the Library this week, so I haven’t had chance to show it off. I won’t get there again this week coming either, as I’ll be working in Bristol. 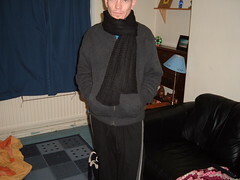 I’m rather shocked – that’s two things I’ve made for A that he actually wears! Moving on to wildlife news…exciting developments in our garden! We’ve been putting out a lot of extra food over the last couple of weeks, as a lot of birds have been struggling in the snow. Last Sunday we were out strolling and got quite worried by the number of little birds we saw which just weren’t foraging. One little robin was sat on a low branch looking thoroughly miserable. So we went to a supermarket and bought 2 big bags of bird food – almost all of which we scattered on our way home. We found our unhappy robin and dropped food close to him, then retreated a few steps. He was straight on that food! It was lovely to see, and to think that for one bird at least, we made a small difference. Anyway, back to our garden. I’ve been watching from our bedroom window from time to time, and there has been quite a range of birds flitting in and out. At one point I counted an adult robin, two juvenile robins, a male adult blackbird, two wood pigeons and a wren. That’s brilliant, given that our garden is tiny and our neighbourhood almost devoid of green places. At other times the robin has been hanging around a lot, not even bothering to fly away when I take out food for them. There have been two wrens at a time as well, so hopefully they are a pair and thinking about nesting somewhere nearby. It’s all so exciting! That’s ‘Winter Berries’ from Laughing Yaffle. 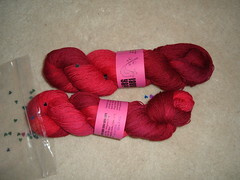 It is destined to become a shawl for A’s Mum for Mother’s Day. 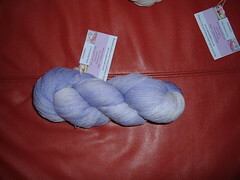 Those two lovelies are ‘Silver’ and ‘Lady’, both from YarnAddict. Silver is for me, probably for a stole. Lady is for a shawl for my Mum for Mother’s Day. If I can complete so much in such a short time. 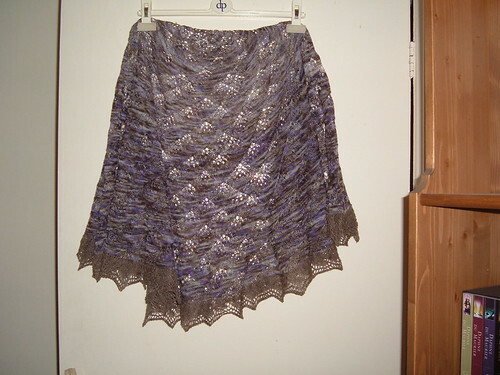 This entry was posted on January 16, 2010 at 11:23 am and is filed under knitting, Wildlife. You can follow any responses to this entry through the RSS 2.0 feed. You can leave a response, or trackback from your own site.